In Exodus 22:2, the law laid out the right of the individual to protect his house and home by force. It says in effect that if someone were to break into your house you could strike out without fear of violating the law. It literally says, “If a thief is found breaking in and is struck so that he dies, there shall be no bloodguilt.” Jeremiah indicts the people of Judah of their abuse of this law. Jeremiah 2:34 says, “…on your skirts is found the lifeblood of the guiltless poor; you did not find them breaking in.” Willis explains this, “The poor are charged falsely with some wrongdoing (in this case, theft) so that the wealthy can gain control of their property.” This reminds me of the story in 1 Kings about the wicked king, Ahab, stealing Naboth’s vineyard by bringing false charges against him. The Hebrew text clearly says “blood on your skirts.” It’s the picture of the priestly robes flowing down to the ground. The point is clear that regardless of where the blood was (hands or skirts) their guilt was obvious. I read of a case in England where a judge found four youths guilty of murdering a man. Only one stabbed him, but the judge said, “It was Jamal Jones who plunged the knife into Dean’s heart. But make no mistake; you all have blood on your hands.” After the guilty verdict the Judge also added how the other three did nothing to prevent it. Neither did they do anything to help the victim once he was stabbed showing their role in the crime. Two men wearing the religious robes of the priests and Levites traveling from Jerusalem to Jericho saw a victim of a robbery near death on the side of the road. They too have blood on their hands and on their robes. 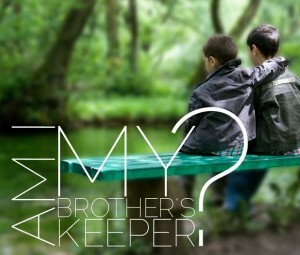 It’s interesting that the first murderer confronted of his crime and witnessed by his brother’s “blood that cries out from the ground” asked “am I my brother’s keeper?” Of course we are!